Father Mark Massa S.J., helped to kick off the 2016 LASSCA Conference in a way that was not only inspirational but also humorous and thought-provoking. Rev. Mark Massa, S.J., dean of the School of Theology and Ministry and professor of Church History at Boston College, presents. Courtesy District of San Francisco New Orleans. 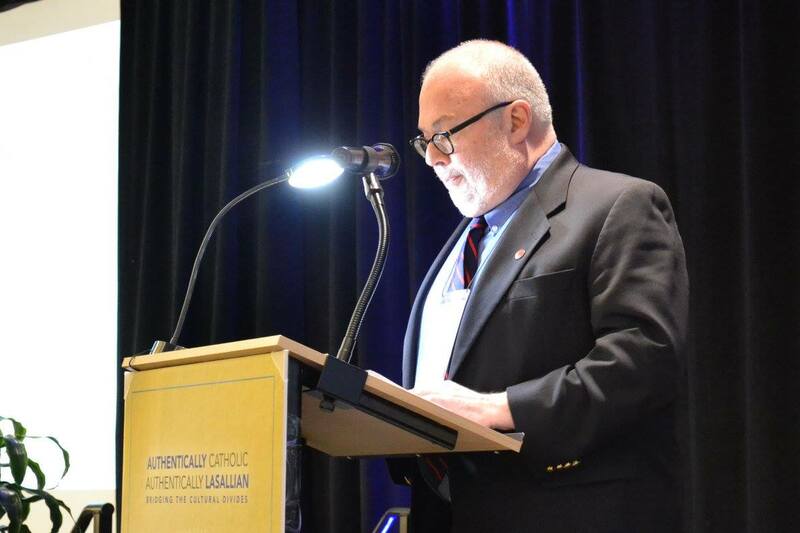 Father Massa, a nationally recognized theologian and scholar, founded the Curran Center for American Catholic Studies at Fordham University and currently holds the position of Dean of the School of Theology and Ministry at Boston College. Speaking on the Conference theme of Authentically Catholic, Authentically Lasallian, Father Massa reminded the audience of the Institute’s long history of not only serving those who may be on the margins of society but also of the history of the Institute’s legacy of service and fidelity to the greater Church. Father Massa noted that, according to a Center for Applied Research in the Apostolate survey, the Catholic Church reflects a 68% ‘retention rate’ for individuals raised as Catholics who continue to identify as a member of the faith as adults. The challenge this presents for catechists moving forward is something that he acknowledged in his comments and that he challenged Lasallians to face in a way that reflects our long tradition of educating for salvation. Breakout sessions on day two included seminars on monitoring employee use of social media by Michael Airdo of the Chicago firm of Kopon Airdo, a review of the emerging impacts of the Affordable Care Act from Christian Brothers Health Benefit Services, a seminar regarding working together in mission by Sister Sharon Euart, R.S.M., of the Resource Center for Religious Institutes, a talk about teaching underserved and immigrant students by Dr. Vincent Carmona, assistant professor of moral theology, the Oblate School of Theology, San Antonio, and a presentation on governance led by George Ruotolo of Ruotolo Associates. After the day’s events attendees gathered within their District groups for an evening of dinner and conversation. Check this page and visit Facebook and Twitter with #LASSCA2016 for frequent highlights and pictures throughout the conference.